Tigger wearing a scarf and 2 raccoons on the bib. Size 18 months dark green overalls. White Rabbit Deluxe Baby Boy Outfit. Includes dress shirt, dress pants, and suspenders. Cute as can be. Size 6-9 months. 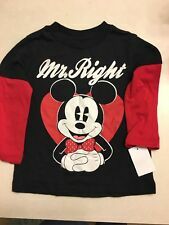 The Shirt says "Mr Right". Disney Baby Mickey Mouse Baby Boy Short Sleeve Bodysuit NWT, free shipping! Bodysuit features embroidered Mickey Mouse details. Includes Disney cuddly bodysuit and beanie hat. Beanie features embroidered Mickey face, and 3D ears. Body: 100% organic cotton. Monsters University NWT. 2 Piece Outfit. Mike's Pupil & Mouth are Sewn. Lounge Set. Screen Print Graphics. Sublimated Graphics. 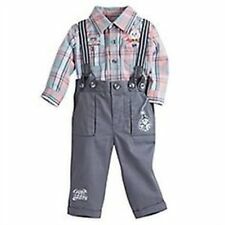 Toddler Boys 3 Piece Outfit. Vest, Long Sleeve Shirt and Jean Pants. Size 24 Months. You Will receive one item of your choice. Smoke and pet free household. Disney Winnie the Pooh Tigger Bodysuit 9-12 Months. Soft, cotton jersey bodysuit with short sleeves and easy popper fastening. Care instructions 100% Cotton. Baby Boys Padded Jersey Mickey Mouse Dungarees And Top Set. • Soft jersey fabric inside and outside. • Warm waddling inside. • Size 0-3 months. You are bidding on 2 x Disney t-shirts size 6 months as follows: 1) red short sleeved t-shirt with Minnie Mouse on the front with "ready for take off" and a pic if some luggage 2) grey long sleeved top with "Mickey Mouse" in red on the front together with prints of Mickey Mouse Both tops are brand new with tags on. Please rate a look at my other items as I can combine postage where possible. Thanks for looking and happy bidding.